Surprise! We’ve had SO many amazing new crafty goodies for you recently – and we’re about to add to that, with a brand new collection from Dovecraft. Get the party started with Dovecraft Make a Wish! 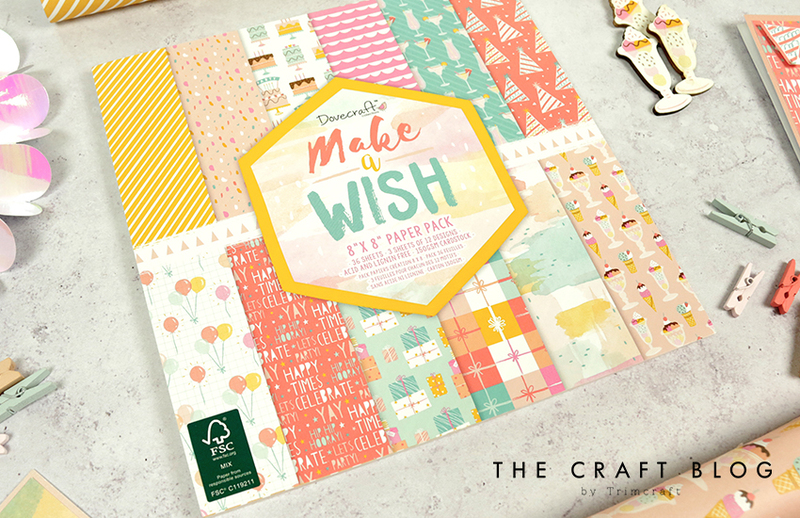 In this collection, we’ve got everything you need to create some amazing handcrafted projects – from paper packs available in three sizes, to fun embellishments. As with every Dovecraft collection, everything is perfectly coordinated so that you can create stylish makes, no matter how much crafting experience you have. Within the paper pack, explore pages bursting with celebration-themed illustrations in a dreamy pastel colour palette. How fun are these?! Perfect for so many occasions too. We’ve also included a decoupage pad for you to really create some eye-catching handcrafted projects! Perfect for embellishing cards, this charming selection can be layered using foam pads to add dimension to your makes. This pack is die cut for easy assembly and features a glitter effect to make your designs extra special! For this collection, we’ve also got a brand new item for you that we think you’re really going to love! This Vellum Quote Pad contains 192 sentiments in a variety of fonts and styles for you to cut out and use to create stylish handmade cards, memorable scrapbook pages, and more! And just look at these wooden toppers! They are perfect for embellishing your makes and we think that they’re really going to add some wow factor to your designs. Tying in with the party theme, we’ve got wooden sundae and present toppers for you! How cute?! We also have some wonderful stickers included in this collection – and we all know that you can never have enough stickers, so we’ve got both sentiment and puffy stickers for you to help add a fun finishing touch to all of your makes. There’s so much more included in this collection – we hope that you’ve enjoyed just a little taster of what’s to come. We’ll be showing you more across our social media in the coming weeks so keep your eyes peeled! 1. Draw a circle onto your card blank against the fold of the card. Cut out the circle shape so that you’re left with a circular card blank. 2. Fold one half of the card in half towards the fold, as shown below. 3. Cut another circle from the Dovecraft cardstock, the same size as your previous circles. Adhere this to the folded circle to create the easel shape. 4. Cover your blank card with the fun Make a Wish papers. 5. Build a decoupage design using foam pads. We chose this fun design featuring a selection of presents and balloons for this particular card! 6. Adhere your built decoupage design to your card. 7. Add a sentiment to the bottom part of your card using foam tape, to act as a stopper for the easel card so that it can stand. 8. Finish by adding puffy stickers and an adorable wooden sundae topper to finish! You now have your finished easel card! This makes a great dimensional card that folds flat to fit in an envelope. Now that you’ve got this easel card design mastered, why not use different decoupage designs and toppers to create other fun cards?! All of the papers and embellishments work perfectly together so that you can come up with endless combinations. Your friends and family will really love receiving Make a Wish cards! So, what do you think to this collection? We’d love to know! Don’t forget to leave your thoughts in the comments box below and keep your eyes peeled in stores over the next few weeks to pick up your own Make a Wish items! Wonderful! The papers are so fun and those wooden embellishments are adorable. How gorgeous, the colours are just beautiful. Such a lovely collection. Beautiful designs and colours once again. Thank you. What an amazing collection here, and just perfect for all the different kinds of celebrations, that we get here in life, and in such adorable colors too. I totally love this. What an amazing collection here, and sooo perfect for both the invites and for decorations for any kind of party as well as the cards we need for different occasions too. I love it.